The book surfaced quite suddenly from nowhere four years ago, and one moment I had never heard of it and the next everyone was enthusing like mad about it. I thought it sounded horrible. The plot, I mean. And then I wondered if I was missing something and needed to read it. And then when I started investigating, someone suggested it was great for younger readers but not necessarily a book for adults. So I never did read it. Even Little Flower’s Granny read it, which surprised me somewhat. Some weeks ago Daughter caved in as well, and went out and actually bought (!) all three books. All I had to offer when she returned to Bookwitch Towers the other day (apart from my lovely company to go and see the film, of course) was a Hunger Games mug (beautiful red) and a Mockingjay pin. The pin narrowly avoided being binned, because I could see it would merely waltz around the house for years, littering, before someone finally threw it away. Turns out it’s very much the item to have. Some people pay money for it, even. So, we went to see the film yesterday (and you can read more on CultureWitch for some sort of film review) and it was good, just as they said. It makes a change, really. I’d say that unlike the Harry Potter films, which must have left anyone who had not read the books totally bewildered, The Hunger Games made sense. I got what it was about, although I allowed Daughter to explain a few things, because I could tell she wanted to. I’m really very good at hating badly cast actors, and I have a fervent dislike of some actors and actresses (usually for no good reason at all). 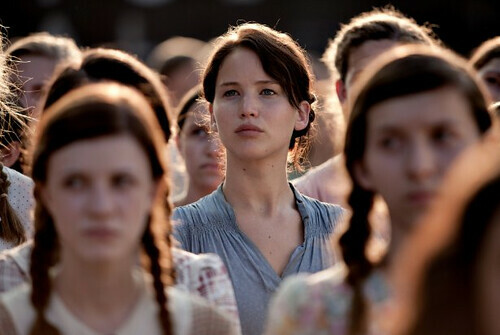 Wonderful to find someone like Jennifer Lawrence whom I actively loved. Whether I will support Team Gale or Team Peeta I couldn’t say. In fairness, we didn’t see much of Gale, so perhaps leave the decision a little longer. Gale is more handsome, but I suspect Peeta might be nicer. And it’s a shame that we have to be so suspicious of any novel-to-film in the YA world. There are several fantastic books optioned, but it’s easy to be cynical and expect very little good to come of it. If my knees were up to it I would go down on them and worship Hilary. She’d need to be in the same room, obviously. She’s not. Just as well, since that avoids a lot of embarrassing behaviour from me. How is it possible to write such perfect stories where (as Daughter said when she recently read her first Casson) nothing happens? Until suddenly quite a few little somethings happen and you laugh and you cry and just feel ridiculously happy. Saffron is looking for her unknown father in Italy. Caddy is trying to become un-engaged. Indigo has lost a good friend and gained a new – unwanted – one. And Rose is trying to help. Eve is in her shed, when she’s not at the hospital, painting stuff to make the patients think of other things. Home. Nudes. There is a dead cat and a loser boy. An expensive ring. Shoplifting. There is Daddy Casson’s girlfriend, who seems exceptionally nice, and well suited to the Casson style. Lancelot and Arthur have minor parts to play. I just wish I’d seen the hint of what was to come a little earlier. I mean I did. I just didn’t stop to think. If ever a series of books was crying out to be given the crossover treatment, this is it. Yes, they are children’s books. But they are also grown women’s books (so could do with an adult cover option…). I love them. I just don’t know how I will stop myself from going straight on to the next book. “Spoiler Alert: If you haven’t read Book 1 (and want to) don’t read ahead! You know what? I hate Will Hill. He is the master of cliffhangers, meaning I now have to wait until the next book comes out. Department 19: The Rising is the second instalment of five (!) and it is easily as good as the first. But Jamie doesn’t only have to worry about Dracula and Valeri, but about his mother, his team and the fact that he feels responsible for Frankenstein’s death. But he is quickly distracted as he is assigned to join the Zero Hour Task Force, to track down and destroy the oldest vampire in the world. At the same time, a man is travelling across America to find an answer, only to be constantly directed somewhere else. I think what I love most about this book is the amount of twists and turns. Will Hill surprises us with discoveries, intrigues us with secrets and makes us, the readers, keep wanting to turn that page over. Even if there is only one minute to go before your lecture starts. And another thing, you can literally see and smell the blood. Though I wish you couldn’t, but that’s just me. I can see how kids will love this, especially since there are no glittering, romantic, pale guys to ruin this vampire adventure. I see that as a threat. So that didn’t happen on here. I think. I’m doing my best. When I hear the word pentominoes (like over coffee with Little Flower’s Granny the other day), my mind can’t help but think through things like pentagons and pentameter and pentagrams and all manner of other pentas. Whereas the Resident IT Consultant thinks other – cleverer – thoughts, and after the coffee he disappeared off and came back looking all wistful over the series of three books by the fantastically named Blue Balliett, which feature crimes solved through pentominoes. 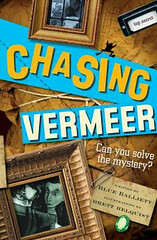 Seven years on from publication I wasn’t hopeful, but amazingly Chicken House unearthed a copy of Chasing Vermeer for me(us). And it appears the book is just as interesting and fun and mathsy as had been expected. Inside the cover Barry Cunningham asks if we are smart enough. I suspect I’m not, but the Resident IT Consultant kindly said I could probably read it without trying to solve the pentomino puzzles. Best to just hand you over to an intelligent reviewer right now. 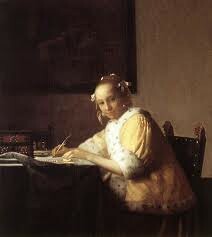 ‘An interest in pentominoes led me to Blue Balliett’s children’s mystery story Chasing Vermeer. Set in Chicago, it appears to be a much more gentile Chicago than the one that features in most American crime fiction. Petra and Calder live in Hyde Park, close to the University of Chicago campus, and attend a middle school originally founded by John Dewey and still clearly loyal to his ideas. Certainly their teacher, Ms Hussey, enjoys a freedom in deciding what her pupils should do that would be the envy of any British Year 7 teacher. A series of apparently unconnected events lead Petra and Calder to develop an interest in A Lady Writing, a 17th century painting by Vermeer. Then, while the painting is being transported from New York for a temporary exhibition in Chicago, it suddenly disappears. Petra and Calder are convinced that the strange events they have observed contain clues to what has happened and decide to search for it. Meanwhile, the unknown thief issues a series of letters and adverts provoking a public debate on the attribution of Vermeer’s paintings. After a long succession of confusions and false trails Petra and Calder eventually discover the stolen painting and we realise how everything they have observed has been connected. This book reminds me of Emil and the Detectives. The children are resourceful and intelligent, they are free to move through their own urban environment and the adults they encounter are generally friendly and helpful. Its pace never slackens, it challenges readers with new ideas and it creates a vivid impression of this part of Chicago, enriched by by Brett Helquist’s map and illustrations. And it’s not afraid to include passing references to mathematics. I particularly enjoyed Petra’s calculation that trains passing her house, do so taking a second to pass each house in the street, and her impressionistic memories of the colours glimpsed so briefly. Now I want to read it too, pentominoes and maths notwithstanding. And I’ll bet I’m not the only one. I’m with Mrs Fickling on this one. It is a good book. 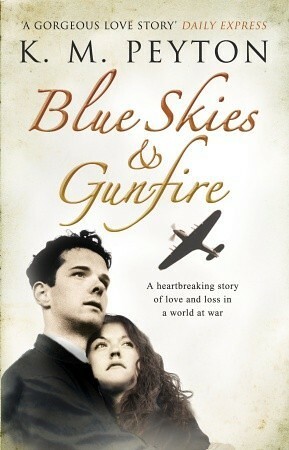 Blue Skies & Gunfire is also a surprisingly recent novel by K M Peyton, on an old topic, WWII. Primarily a romance, it is just the way I like a book to be. You can tell that Kathleen lived through the period she writes about. The description of London and the Southeast is so much more vivid for all the everyday details, both about the war, but also about people ignoring the war. I never used to understand how you could come almost eye-to-eye with German pilots, nor how easy it must have been to allow romance to go at full speed, since you couldn’t expect someone to be alive the next day, let alone after the war. 16-year-old Josie is evacuated to her aunt’s in Essex, where she meets and falls in love with the lovely Jumbo, in the Big House. He is hoping to become a pilot. Then Josie meets Jumbo’s brother Chris and falls in love with him. He already is a pilot. You can tell this is not going to end well. The main question is which kind of not well and for whom. Both brothers are lovely boys. You just know someone will have to die, and someone will be devastated. But who and in what way, and how will it be resolved? I had several options in my head, and I suppose the end was close-ish to one version. I just wish the last chapter hadn’t been there. I sort of want some things to be unsaid. Now that they are not, I am slowly coming round to it being the best way after all. Maybe. Or more accurately, with her in my hand. I have owned Hilary McKay’s World Book Day 2005 short book about Rose for an absolute age. I don’t know when or where or even why I got it. This was before I discovered and fell in love with the Casson family. It also wants to be very very good. So basically, I don’t want to waste such a perfect book for when it’s not needed. I’ve read the first chapter several times, and this week I was ready to go further. I mean, who would not want to be accompanied by little Rose wetting herself in class, as you are waiting to part with some blood? 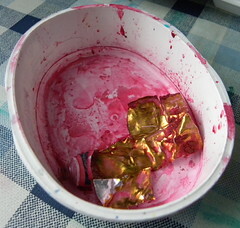 (Anyone squeamish; leave now!) Very little blood, but I like hanging on to it. Not my mind so much as the rest of my body. I know I have blood. But none to give nurses when they come looking for it. So as I was enjoying the post-wetting agonies of Rose and the possibility that her darling Mum had been murdered in the shed in the dark, I was led from blood-taker to blood-taker with as little success (for them) as that day in 1992 which scarred Son for life. Bet that added to my popularity. I obviously didn’t hold Hilary while the blood reluctantly trickled out, seeing as my arm was otherwise engaged, but her spirit was present. And to avoid fainting by the zebra crossing outside I sat in the waiting room with Rose, recovering while she dashed down the road in the thunder storm, with dead hamsters behind her, or not. Then I went home and came to the conclusion that I deserved the blood donor’s traditional treat of tea and biscuits. The Resident IT Consultant pointed out I had not parted with enough blood for this, but I still drank my tea with enjoyment. Then I allowed myself to finish The Flying Feeling as an extra special treat. Pin cushions are entitled to treats, some of the time. Today I’m happy to have Miriam Halahmy on the blog. You will remember my review of Illegal the other day? Here Miriam tells us about some of the things that inspired her, and she certainly has a lot of experience of teenagers like Lindy and Karl. Not everyone has had television sets thrown at them. ‘Illegal is the second novel in my cycle of three novels set on Hayling Island opposite the Isle of Wight. Each novel is stand-alone but a minor character in the previous novel becomes the major character in the next. Illegal is Lindy’s story; the story of a teenage girl driven to take desperate measures when all other choices are taken away from her. It is a novel about growing up and gaining independence against the odds. In this book I have focused on the needs of vulnerable young people in our society who do not come from supported backgrounds. I was a Special Needs teacher in London schools for 25 years and worked with many pupils like Lindy and Karl. Lindy is based on an amalgam of pupils I knew with emotional and behavioural problems. Many of these pupils cannot cope in mainstream classes and attend special units with a very high pupil teacher ration. Even then they present very challenging behaviour fuelled by a whole range of factors such as difficult home backgrounds, drug taking, peer group influence and sensory and emotional problems. One girl I worked with had grown a fingernail and then sharpened it to a fierce point. She threatened everyone around her but inside she was a very frightened person as a result of abuse she had suffered. Another boy was going deaf and refused hearing aids. He simply couldn’t control his anger and broke windows, furniture and doors. Another lad threw a portable television at me one morning. You learn how to duck in this field of work!! Inside all of these damaged, angry and very frightened young people were decent human beings trying to emerge. Some of the pupils I have worked with were mute, like Karl. This is a terrible affliction and reduces the sufferer to a shadow. They cannot make friends, their education suffers and they need very specific therapy. A paediatrician confirmed to me that the shock Karl experiences in Illegal could trigger speech again. But it’s not the ideal cure! I believe that with the right support every young person has a future. It concerns me that in these days of austerity the support needed by young people on the very fringes of our education system may be cut and opportunities reduced. I am certainly convinced that last August we would have had much less trouble on our city streets if there were youth clubs and youth leaders engaging with young people on the margins of our societies. Let’s hope it does. I have great faith in the power of books, and if I were a doctor I’d prescribe them. And if I was the government I’d start spending our money rather differently. The trouble with them, though, is they’ll never be as wise or sensible as I am.